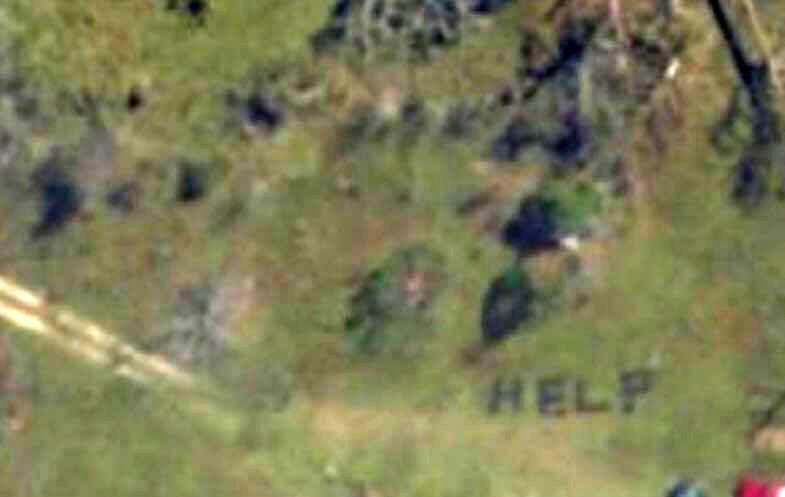 A Florida woman spotted her uncle's SOS in a satellite image showing Hurricane Michael's destruction and alerted authorities over the weekend that he needed to be rescued. Ernest Gee spelled H-E-L-P in fallen trees after the storm made landfall last week as a Category 4, his niece Amber Gee told ABC News. Amber Gee, 24, of Callaway, Florida, saw the distress signal in an interactive map from the National Oceanic and Atmospheric Administration that uses satellite images to show the devastation in the Florida Panhandle. "I had been seeing this link for the images all over Facebook, and I decided to check it out, and we lucked out," Gee told ABC. When the mother of two looked at her grandmother's house on the map in Youngstown, just northeast of hard-hit Panama City, on Saturday, she saw her uncle's SOS. While Gee's grandmother had already evacuated, Ernest Gee, his wife and a friend of theirs had been staying at the house. After seeing her uncle's message, Amber Gee called Bay County's Department of Emergency Services. The agency said on Facebook early Sunday that it dispatched assistance to the house. "I didn't think it was going to really work to see anything with the images," Amber Gee told ABC. The Bay County agency said it was "an incredible story of how people are working together in this situation."